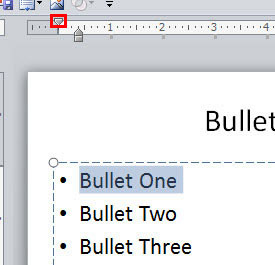 Learn how to tweak the bullets using the first line indent marker in PowerPoint 2010. You have already learned about the indent markers on the Horizontal Ruler, and how they can influence the bulleted paragraph on your PowerPoint slide. There are three types of Indent Markers you can find on the Horizontal Ruler: the First Line Indent Marker, the Hanging Indent Marker, and the Left Indent Marker. The First Line Indent Maker, also called the Top Caret can be found highlighted in red in Figure 1, below. In this tutorial, let us learn how the First Line Indent Marker influences the position of the bullets. Figure 4, below shows the position of the selected bullet character when the First Line Indent Marker is dragged and placed in a position where it overlaps the other two Indent Markers (Hanging and Left Indent Markers) on the ruler. You can also drag the First Line Indent Marker rightwards beyond the position of the other two indent markers as shown in Figure 5. As you can notice in Figure 6 above, the actual position of the bullet character is not at all moved beyond the Hanging Indent Marker (Middle Caret). Instead, the paragraph has been moved to the new position where the First Line Indent Marker has been moved! Moving the First Line Indent Marker only towards the left side of Middle Caret will show the effect on the bullet position. Thus, although you can actually drag the First Line Indent Marker rightwards as much as you want, this only influences the text, and you cannot move the bullet any more rightwards beyond the position of the Hanging Indent Marker (Middle Caret). If your selected bulleted paragraph is in lower hierarchy (Bullet Level 2 or lower), as shown in Figure 7 below -- then you can also drag the First Line Indent Marker towards left. Refer to Figure 7 again.